A bit about what Pinterest is, what it will soon be, how it got started, and how it can help you promote your Wizzley articles and Zazzle products. I learned on CNN yesterday that after the latest bit of fundraising Pinterest is valued at 5 billion, up 32% from 7 months ago, when it was valued at 3.8 billion. Today I read some newspapers articles to see what it's all about. Judging from the facts (no revenue yet, just 750 million users and 30 billion pins), it may very well be a bubble, as many people comment. At the same time, given how many people look for recipes, travel photos and info, and wedding and fashion ideas there, their new promoted pins are likely to be a winner, given that, as Pinterest cofounder and CEO Ben Silbermann says, people come to Pinterest to discover things (whereas they go to Google to research specific things: take, for instance, looking for Mother's Day gifts versus searching for sterling silver jewelry with her favorite gemstone). Also, as its proponents say and as the news anchor on CNN remarked as well, many people come on Pinterest with the intention to buy. There is also the issue of consumer data as big data, which, as some analysts say, is even more valuable than the clicks leading to the sale of one product or another, even as the returns on some of these clicks may be quite big: consider airline tickets or travel packages, wedding gowns, etc. As of right now, Pinterest has over 70 million users globally (up from 48.7 million users in February). Americans seem to be more active than international users; 40.1 million of them log on at least once monthly. Of course, there are also many who log on much more often. As it's replete with great suggestions for all sorts of projects in your life, Pinterest has become the go-to place for many looking for a bit of inspiration. If you've never used it, you may not have a clear idea of what Pinterest is, so here are a few words and a few screenshots to give you a sense of what Pinterest looks like and how it's used. Pinterest is an image-based social media site, a digital scrapbook that allows users to collect tiles or "pins" and organized them into "boards." The site is actually very easy to use. (It's also quite popular with users of mobile devices; according to Callum Delo at AdAge.com, 75% of usage is via apps.) As you have probably noticed online, the Pinterest look has been adopted by other social media sites, recipe sites, etc. Web sites, Wizzley among them, became image-driven in the wake of Pinterest's success and the wide adoption of smartphones and other latest-generation mobile devices. Here's how it works: You search for what interests you and then click a "Pin it" button to add an image to one of your existent boards. You can easily create a new board from the popup window. You can amass this way large collections of recipes, quotes, etc., as I have. Once you have created boards and added pins to them, you can easily move the boards around by dragging and dropping them. You can also choose an image for the board or let a random one become the board cover. Pinterest is also a nice option to have when promoting items from Wizzley articles or from Zazzle, especially now that Pinterest has instituted rich pins, which allow you to pin images that show prices as well, are updated when their source product on Zazzle, for instance, is updated, etc. They also allow you to make a commission on those Zazzle products pinned to Pinterest. Pinterest has tested promoted pins and will soon start implementing them. According to Cotton Delo at AdAge.com, it has already made agreements with Kraft, General Mills, Ziploc, Nestlé, Gap, Expedia, and other companies. Campaigns will last three to six months, and the promoted pins won't show up in the Home Feed (with pins from boards and people you follow) or on your own boards. They will show up only when you search for pins using keywords or Pinterest's categories (and they will be marked "Promoted Pin"). According to the cited article, Kraft targets 25- to 54-year-old women for their next Pinterest campaign. Given that 85% of Pinterest's users are female and that they seem to be interested in recipes, Kraft seems to have found a good venue for their products. Pinterest was founded in March 2010. By August, it had 5,000 users. That all spiked to 17 million in April 2012 and 750 million this month (May 2014). The founders are Ben Silbermann, Paul Sciarra, and Evan Sharp. Ben Silbermann is the CEO. He was born in 1982/1983 (yeah, I wondered about that, too) and grew up in Des Moines, Iowa. His parents are ophtamologists and he had plans to become a doctor as well but after the Research Science Institute at MIT, a Bachelor's in Political Science at Yale, a stint at Google in the sales department (another source, based on one of Silbermann's speeches, says customer support and a few things besides that: data analysis, product design suggestions, etc.) and another one designing iPhone apps (info from Wikipedia), he decided to bet his future on Pinterest. The Pinterest story started with an iPhone app called Tote that Ben developed with a friend from college, Paul Sciarra. Tote was meant to help users find products from their favorite stores easier, save them, learn about price discounts, while also keeping track of the latest fashions. Getting the money to launch a bigger thing was hard, as the word was hit by recession. In fact, it all began a week after he quit his job at Google, where he kept complaining about not being given free rein to develop products. Soon, however, one investor embraced the Pinterest idea, and others followed. It was at this time that "a friend of a friend," Evan Sharp, joined Ben and Paul in their venture. Ben said in his 2012 speech (see an article here) that "It was like he was the only one who understands [understood] what I was saying." The tile grid was Evan's idea. It all gained momentum in May 2010, when a certain Victoria Smith came up with "Pin It Forward," an initiative that spread among bloggers. She also organized the first Pinterest meet-up. She then got to be, for a while, Pinterest's community manager. The rest is a success story. Often, a change of scene is all the inspiration you need. What Do You Think, Is Pinterest a Bubble, or Is It Here to Stay as a Success Story? Since I joined Wizzley, I am using Pinterest religiously. 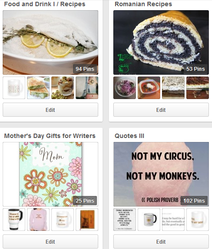 I believe a great deal of Wizzley traffic comes from Pinterest. Somehow I'm mostly selling directly from Zazzle. But I've sold through third parties too. Mira, It's so convenient to have Pinterest's past, present, and future summarized in one place. It's also helpful the way that you give samples of your boards. Do you have any way of knowing whether it's equally or more successful for your articles here or your products on Zazzle? I haven't seen the promoted pins yet, but yes, they seem like a good idea. For the foreseeable future anyway, Pinterest seems to be a real force on the net. I can't help but wonder, however, about any venture with no revenue... wonder what their actual business plan is? The promoted pins may be the first step towards profitability. I love the gorgeous photos on Pinterest myself, and I enjoy pinning there because I can see that others pin my images further. Also, like you say, I find great ideas there. I love pinterest and enjoy using it as inspiration for a whole host of things including ideas for the home, garden and crafts. I certainly hope it stays around for a long time. This is a valuable article for understanding Pinterest and how it can be used to promote our articles here. Thanks, Mira. Fun quote mugs about coffee love. You can personalize them by adding your name or first name initial, and you can also create your own coffee mug. Zazzle cards, postcards, iPad cases and other gifts (some of which you can personalize) which would make great Valentine's Day gifts for teenagers and twenty-somethings.